Enstyrock is a new aggregate for producing light weight, strong, insulating concrete. The aggregate is produced by agglomerating EPS particles with a strong rigid binder to achieve high strength aggregate with low density. 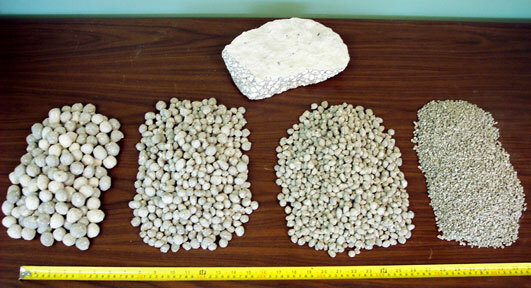 Enstyrock usually replaces the gravel in conventional concrete mix designs. This type of mix gives a high strength light concrete with insulating properties. Enstyrock can be formulated to a strong concrete with greater than 80% recycled material by volume. Enstyrock is a new invention taking advantage of the light, durable, insulating properties of EPS and for the first time adding high strength and ease of mixing. Enstyrock has been used to achieve concrete with strength to density ratios not previously achieved with recycled EPS. Enstyrock does not absorb much water and thus does not require presoaking like so many conventional light aggregates. It is available in sizes from 0 to 1.5 inches.